Contagious viral disease, especially of children, marked by rash, fever and conjunctivitis, sometimes having severe complications; also known as rubeola. Persons most commonly affected: Children of both sexes but can occur at any age in people not immunized or previously exposed to the infection. Organ or part of body involved: Skin, upper respiratory tract and eyes. Symptoms and indications: The first symptoms are likely to be a low fever and slightly swollen glands in the neck. These are followed by a rash of flat reddish spots, which generally do not itch. If you are infected, you go through a 10 to 15 day incubation period, during which there are no symptoms. Toward the end of this period you become contagious. The preliminary symptoms - swollen glands and fever - last anywhere from one to five days, and the rash about three days. You remain contagious for about a week after the rash has faded. Recovery is complete. The immune system makes chemicals called antibodies that destroy the virus. Afterward you have natural immunity to the disease, that is, your immune system has produced enough antibodies to the virus so that it cannot successfully reinvade your body. Causes and risk factors: Caused by a virus which is transmitted via droplets of moisture from the respiratory tract of an infected person that travel through the air. 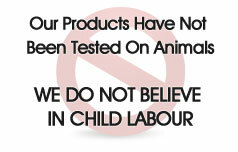 It is an unpleasant infection that makes the child feel quite ill. Complications can occur, especially pneumonia, and middle-ear infections that can result in deafness. Also, inflammation of the brain (encephalitis) or meningitis can occur as a result of measles, and the infection may prove fatal in some children. 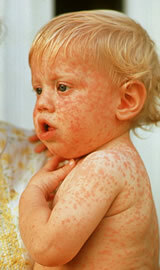 Prevention: Immunization is the only way to prevent measles at 15 months of age. The treatment must focus on relieving the patient?s discomfort. A vaporizer in the room will ease cold like symptoms by adding moisture to the air. If the eyes are irritated, warm compresses may relieve the inflammation. Also, dim lights are easier on the eyes. Application of a soothing lotion, to the rash to relieve itching. Children having measles should not be allowed to mix with others so as to avoid passing on the infection to them.